Spring is a great time for people to play in the yard with their pets and relax together in the garden. 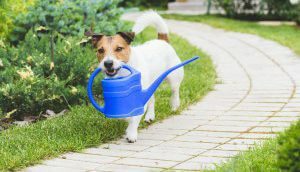 While many dogs are delighted to spend time outdoors, veterinarians from BluePearl Veterinary Partners say it is important to be mindful of toxic plants and other garden dangers. It might be a surprise to learn that one of the biggest front yard dangers is actually a variety of mulch. Cocoa mulch, known for its rich chocolate-brown color and nutritional benefits for soil, is very dangerous and toxic to dogs. It contains cocoa shells and various chemicals that can make a dog very sick if ingested. Unfortunately, the chocolate aroma appeals to many dogs, making cocoa mulch a huge threat in the gardens of pet families. Cocoa mulch ingestion can lead to vomiting, diarrhea, rapid heart rate, muscle tremors, weakness, seizures and even death. While cocoa mulch may look appealing, pet owners may want to choose a safer alternative such as dirt, stones or mulch without dangerous cocoa hulls or chemicals. Fertilizers also can be highly toxic to dogs. Commercial fertilizers may provide nutrition for plants, but they contain harmful chemicals which are toxic to dogs. When sprinkled or sprayed over a lawn or garden, it is often easy for a dog to come in contact these dangerous chemicals. Signs that a dog ingested fertilizer include drooling, nausea, vomiting, diarrhea, difficulty breathing, neurologic signs such as tremors and seizures, and abdominal pain. Organic fertilizers sound safe. But surprisingly, many of them actually are more dangerous. Organic, or “natural,” fertilizers often contain various “meals” leftover in the farming or meat industries. These products, such as bone meal, blood meal, feather meal and fish meal, are very attractive to dogs, but also very unhealthy for their digestive systems. Complications in dogs who ingest organic fertilizers include vomiting, diarrhea, obstruction and severe pancreatitis (inflamed pancreas). Autumn Crocus: The autumn crocus is known for pretty purple and fuchsia flowers that blossom in the spring. But this colorful member of the lily family causes a burning feeling in a dog’s mouth. Other symptoms include digestive distress, liver and kidney damage and heart complications. The highest levels of toxicity are found in the bulbs. Azaleas: Usually boasting a bright pink hue, azaleas bring a pop of neon color to any garden. Though these flowers are pretty to look at, they can be fatal if ingested by your canine companion. Symptoms include digestive problems, such as vomiting and diarrhea, and low blood pressure. Daffodils: Sunny and star-shaped, daffodils provide a pleasant dose of sunshine appeal to a front lawn. But these flowers are highly toxic to dogs. If ingested by a dog, symptoms such as vomiting, diarrhea, abdominal pain, convulsions and a drop in blood pressure may arise. Tulips: Tulips are a very common garden flower, but they contain toxins that can make a dog very ill. The bulb is the most toxic portion. Symptoms of tulip ingestion in dogs include excessive drooling, nausea and irritation in the mouth. Oleander: Oleander is a popular and colorful shrub typically found in warmer climates. It contains cardiac glycosides, which can be fatal to dogs. Signs that a dog has consumed oleander include muscle tremor, vomiting and bloody diarrhea. Amaryllis: The amaryllis flower is often very distinct because of its vibrant red color. It is filled with toxins, however, that can induce vomiting in dogs. Other symptoms include depression, hypersalivation, anorexia and tremors. Sago Palm: While sago palm may look like a simple green, leafy plant, it is actually highly toxic to dogs. This common plant, which grows outdoors or indoors, can cause bloody vomiting, bleeding disorders, diarrhea, liver failure and death. Dieffenbachia: This leafy plant adds natural allure to the home, both indoors and outdoors. Also called dumb cane, dieffenbachia is known for causing oral irritation and difficulty swallowing in dogs. Dogs may also experience a burning sensation in the mouth and possible vomiting. Kalanchoe: Covered in small delicate flowers, kalanchoe is also known as the Mother-in-Law plant. Found both inside the home and in the garden, kalanchoe is often easily accessible to dogs. This toxic plant causes vomiting and diarrhea in dogs. Cyclamen: Pleasant and pink, cyclamen actually contains poisonous. Symptoms in dogs include vomiting, mouth irritation, diarrhea, seizures and in rare cases, death. BluePearl veterinarians urge pet owners to actively supervise their dogs outdoors. If your pet ingests a harmful toxin in the garden, seek immediate emergency veterinary care. For questions about outdoor pet safety and general pet health, please contact your family veterinarian.